Today was my first visit to Afters and after standing in a long line, I tried two samples. The first flavor I tried was Vietnamese coffee and to me it tasted just like any coffee-flavored ice cream would taste. The second flavor I tried was the Jasmine milk tea. In this case, it tasted exactly like Jasmine milk tea would taste! 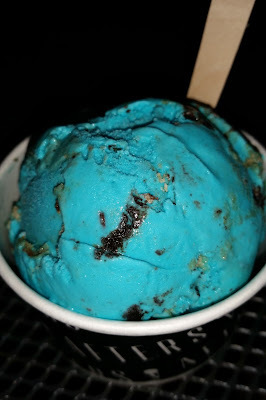 Then, after trying the two samples, I took a risk and blindly ordered a scoop of the Cookie Monster in a cup. It should be noted that eating Cookie Monster will temporarily turn your tongue blue as well.